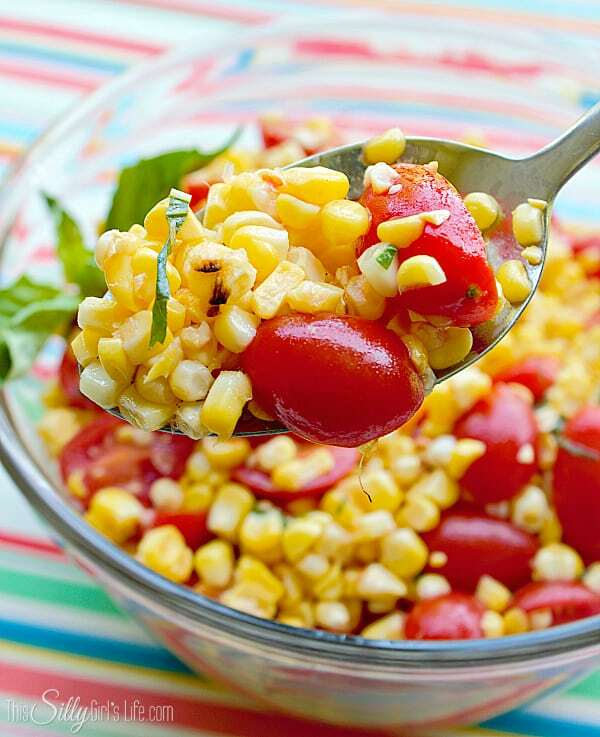 Corn and Tomato Salad, easy to make and perfect for a summer bbq. 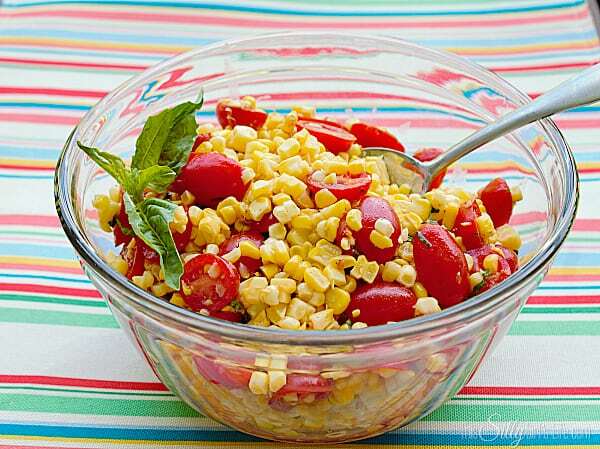 You will love this delicious corn and tomato salad! Welcome to a whole new recipe series! In case you aren’t familiar with our monthly series, Parrish from Life with the Crust Cut Off and I bring you a new series themed recipe each week for the month. This month we are focusing on grilling recipes! I hope by now you are getting warmer weather and being able to enjoy the outdoors! Here in Florida I have already been grilling for a couple months and I have been dying to showcase some more grilling recipes for you all! Today I have for you a super fresh corn and tomato salad. 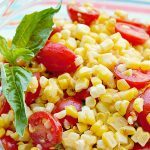 Grilled corn on the cob mixed with ripe grape tomatoes tossed in a light fresh basil vinaigrette, you can serve it warm or cold but the longer it sits the better! I personally like it better cold, so make sure you grill the corn ahead of time and make the salad a few hours in advance before serving it chilled! Remove out husk and silks from corn. Grill on oiled grill gates over medium high heat for about 10 minutes rotating every few minutes. 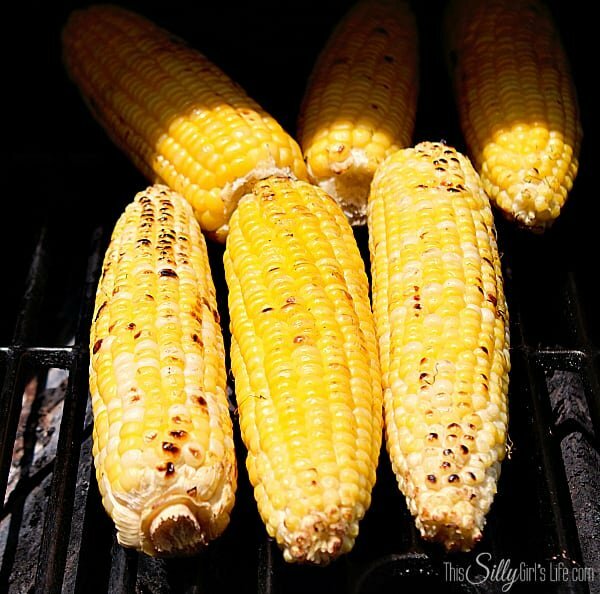 Take corn off the grill and set aside. Slice grape tomatoes in half and add to a large bowl. When the corn is cool enough to be handled, cut the kernels off the cob and place in the bowl with the tomatoes. In a separate bowl, mix the remaining ingredients for the vinaigrette. Pour vinaigrette over the corn and tomato mixture. Refrigerate a few hours in advance until ready to serve or serve immediately if you prefer it warm. Enjoy! Corn Tomatoes Salad- delicious every time! Yum! Doesn’t this just look like summer in a bowl?? What is the best tomato for a salad? 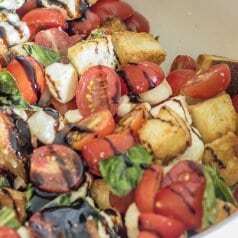 For this salad I used grape tomatoes but cherry tomatoes would also work well! Yumm! A cherry tomato salad! Should tomatoes be cut in half for salad? I do recommend cutting the tomatoes in half. It makes them easier to eat. I hope you like this recipes, what are your favorite veggies to grill?? 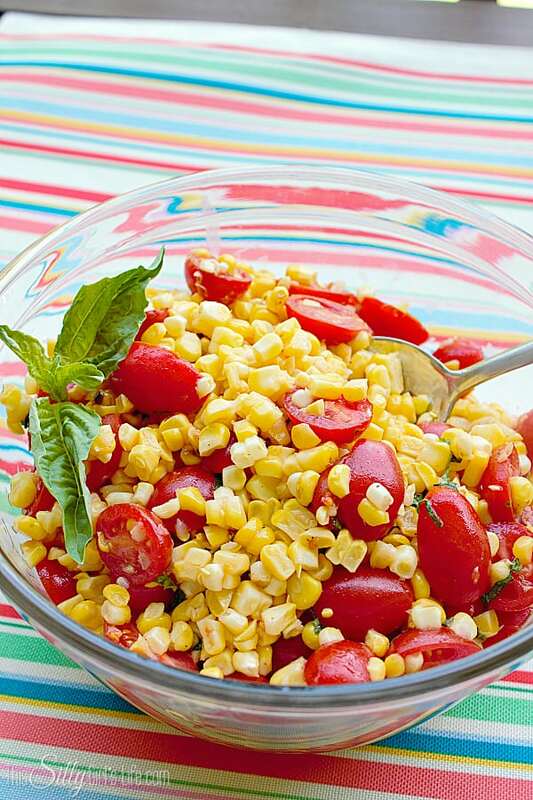 Corn and Tomato Salad, easy and delicious for any summer meal! Remove out husk and silks from corn. Grill on oiled grill gates over medium high heat. You are looking to get the outside slightly charred, about 10 minutes rotating every few minutes. 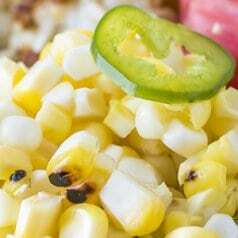 Take corn off the grill and set aside. Place in fridge a few hours in advance until ready to serve or serve immediately if you prefer it warm. Enjoy! This looks awesome but apartment living means I don’t have a grill. Is there another way to prepare the corn? Sure! Cut it off the cob first, then toss it in a tablespoon of olive oil. Turn on the broiler in your oven and cook until just golden, like the pictures on the grill, then continue the recipe as written! CSA season is almost here, and I get so much delicious corn and tomatoes. Sounds yummy…perfect for us in San Antonio!! Thanks for sharing on the Thursday Blog Hop!! Can you say yummy?!?! And how simple! I love simple! 😉 Can’t wait to try this! Thanks for linking up with Wake Up Wednesday. 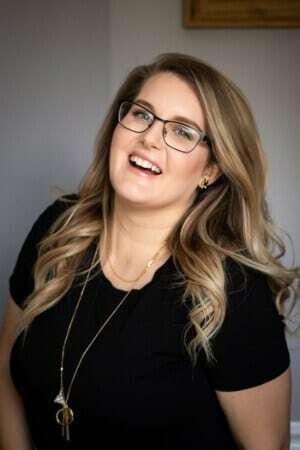 Stopping by as a co-host! Oh my….this does look and sound amazing! What a wonderful dish to take to a family BBQ or Church Pot Luck Dinner. Thank you for sharing at Tasty Tuesdays. I can’t wait for our garden to come in to try this out. I’m pinning it for then. This looks delicious! I have made a similar side dish with feta in addition to the corn and tomatoes, but have not tried making my own basis vinaigrette. I can’t wait to try it! I am probably the only one in my family who will eat this since I am the only one who loves tomatoes so I am going to make this one all for myself. 🙂 It looks delicious and just in time for some great summer recipe ideas. I can see myself sitting by the pool with this already. 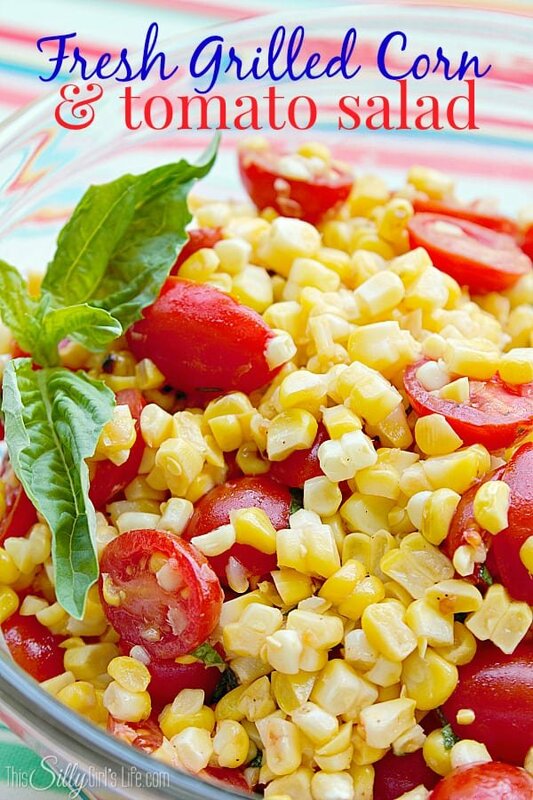 Corn and tomato salad is one of my favorites! It takes me back home emotionally and my stomach really appreciates the effort, ha! Yours look amazing! I can’t wait for trying it next long weekend. Oh my, this looks wonderful! My husband is growing corn and I am growing cherry tomatoes, so I am pinning this to await our harvest! Thanks so much for sharing with the Let’s Get Real party. Also pinning this to our group board. This looks SO good! 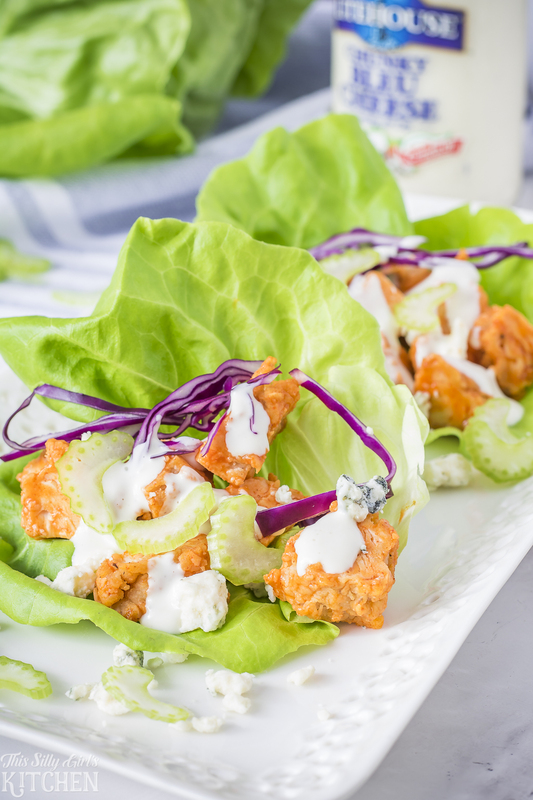 So fresh and healthy – totally want to try this, pinned! Thanks for linking up to Marvelous Monday this week – love this fresh salad! Pinning! Yum, that sounds amazing! And now that we have a grill, I can definitely try it! Pinning this for sure, and I just wanted to let you know that I featured this on my blog this morning; thanks for sharing at the Creativity Unleashed link party! Stopping by to let you know I am featuring your yummy corn tomorrow! Thanks for joining the Perpetual Party Board! Definitely making this salad this summer! Sounds delicious!